Welcome back to our regular Tuesday Tunes programing guys! 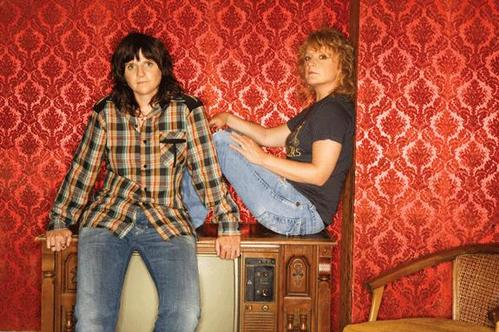 I have a real treat for you all today... it's Indigo Girls!!! Have you heard of them? If not, today is your lucky day and I bet you'll walk away loving them as much as I do! I was first introduced to these guys a few years back at work by a colleague. I loved their sound and harmonies... so rich and just the perfect complement to their lovely lyrics. When you hear their songs, you can't help but notice how insanely in sync they sound... which is no surprise seeing as how these ladies have been performing together since high school! Quirky fact, they looked through the dictionary for help naming themselves, came across the word indigo and it stuck. Their unique folksy-rock flair definitely keeps me in a playful mood and I find myself singing along without meaning to (yep even in Starbucks). Through out their careers, these super gals have remained active and strong influences in all kinds of campaigns and charities. Some causes close to their hearts include the environment, Native American rights, abolishing the death penalty, recycling (which they've incorporated on their tours), human rights, and LGBT rights... phew how's that for saving the world! Both ladies are self named lesbians but prefer the term gay because it's shorter and although their have been rumors, have never been in a relationship together. But in my little world, I always like to imagine the lead singers as a couple, and to me they would be the cutest and most in love couple ever!!! I loooove the IG's! My sister is obsessed with them - she actually met them a few months ago with backstage passes! She said they were amazing (not surprisingly). My faves are: Love will come to you, Collecting You, Yield, Strange Fire and Devotion. I love them. Don't they just make you smile when you hear them come on? Lucky sis of yours, I would love to see them =) JB.